This article first appeared in the Lure Angler magazine. Many thanks to Elton Murphy for permission to reproduce it here. The stick float bobbed and twisted in the current where the tiny river Len empties over the weir into Mote Park Lark, in Maidstone. Weeks before, I had watched the bream as they spawned in the current. Now a shoal of perch were feeding, attracted by the hatching fry. Suckers for a stick floated worm. The float dipped and another fish was hooked, not big. Like most of the others around 6 ounces, with the odd fish to ten ounces amongst them. Beautiful fish with green sides and flaming red fins but to tell the truth, I was getting a	little bored. I rummaged around in my tackle bag, searching for the box containing the few lures and spinners which I had collected over the years. Like many anglers, I kept such a collection. Maybe, when I was pike fishing and couldn't catch live bait, and the deadbait ran out, I could always try a lure - but I never did. I took off the stick float and attached a trace and spinner (This was probably the biggest mistake of my life!). I flicked the spinner out into the current and started the retrieve. Wham! The rod went round and the line shot off to one side. Soon another perch, not much different to the others I had caught, graced my landing net. This time though my hands were shaking as I removed the hooks. Another cast, another fish. I couldn't believe the power of these fish as the hit the spinner, or the ferocity of the fight they put up. I didn't know it then but, looking back, it was really me who was getting firmly hooked. After a while, I thought a move to another swim might bring success of a bigger kind and started out roving - another education. As I went from swim to swim, visiting parts of the lake I had never fished before, I discovered just how much there was to learn about the water. I saw huge carp cruising, miles from where the carp boys had their pods set out; I got to chat to other anglers who really knew the water, I found swims I never knew existed. Finally, as a spinner flashed within a few feet of the bank, I experienced that heart stopping moment that is the addictive thrill of lure fishing. A jack shot out from the weed, hit the spinner, twisted against the strike, sending up a shower of spray, and was gone. Legs like water, and hands trembling, I cast again. Hardly daring to breathe, I watched as the lure came toward the bank. My heart stopped again as I saw the following shape. The rod went over and that was the end of my stick-float fishing. It was also the end of legering with luncheon meat for chub and the end of warm summer evenings waiting for the tench to stir. A whole collection of rods, reels, floats, keepnets etc., reduced to dust-gathering shapes in the garage. I was a lure-fisherman, I was obsessed, and I was broke. How could I afford to spend seven to fourteen pounds on a single lure, only to lose it after a few casts on some hidden snag (there are a lot of those in the waters I fish). Now, I know that most of you lot reading Lure Angler, hardly ever lose lures. Years of experience has perfected your casting technique so that you can drop your lure safely within centimetres of that bush on the far bank (just like me - ho ho ho!). You have developed that sixth sense that just tells you when a swim contains a shopping trolley, motorbike or missing airliner. If the worse comes to the worst, you have developed techniques to retrieve lures from sunken forests (60lb braid, and soft wire hooks help). Or you are rich enough not to care. But I was a complete novice, with three teenage children, three cats, three guinea pigs and a rabbit to support. Now I'm no handyman - just ask my wife and three teenage children (the rabbit appreciates the run I made - it escapes quite often), but it occurred to me that I could make my own (then I wouldn't mind losing them so much - ho ho ho!). After all, a lure is just a bit of wood with hooks stuck in it, isn't it? A bit of research amongst my local DIY stores and tackle shops convinced me the project was feasible. I purchased a length of ¾ inch beech doweling (broom handles work out cheaper), hooks, split rings etc. A bit of work with a wood-rasp and I soon had a basic shape, which I thought might work. I wanted to test it for action before finally fixing the hooks properly and before painting it, so it was a fairly rough effort that I cast out on my next trip. I chose the swim near the locks on a local river, where the water was crystal clear. The thought did cross my mind that a pike would have a go whilst I was testing it out (I sometimes convince myself that I'm going to win the lottery). Still a bit unsure, about the safety of the hook fixings, I gave it a go. It performed perfectly. Running about 2 - 3 feet deep, it wiggled back toward me. Impressed, I just had to give it another go. As it came toward the bank, I saw a shape detach itself from the weed, and head toward it. "Crikey!" I said (or something like that). "A bloody great pike!" except the back half was missing? The shape hit the lure 3 times, from the side, without hooking up, then swum off up-river. It was then that I saw the stripes of the biggest perch I've ever seen. Now it's hard to describe my feelings at that moment; surprise, a tinge of relief that I had not left insecurely fixed hooks in a pike, shock at seeing such a huge perch (it really was something), but most of all the thrill one gets from having fooled a fish with the craft of my own hands. That is the almost indescribable pleasure one gets from 'rolling your own'. It starts on a day, maybe when the weather is just too horrible to go fishing, or maybe a hot summer's day, when it's too hot. You take a piece of wood and begin shaping it, and, as it takes shape, you start to picture how it might fish. How deep will it go? Will it wiggle, or veer from side to side? Will it fish best fast or slow? On a miserable day, with rain lashing at the window, you're suddenly on the bank, working a lure among the lilies, casting beneath the alders on the far bank. You start to think of a colour scheme for the piece of wood, now beginning to look like a lure. Green and silver? Chartreuse? Fire-Tiger? (Usually it's botched up finger blobs but hey, the fish don't seem to mind). Soon it's time to try it out for real. Now comes a new thrill for the home made lure maker. That first cast and retrieve. Time spent getting to know the lure. Every lure you make will be different (at least mine are!). No matter that you are trying to recreate a past pattern, each lure has its own individual quirks. The only way to discover a lure's potential is to fish it. Retrieve it fast, retrieve it slow, jerk it, try long fast sweeps, discover all of it secrets and sometimes a few surprises too. Talk to people who love machinery, old steam engines, and wood and fabric aeroplanes. Get them in the right mood (it sometimes takes a pint or two) and they'll start talking about the 'soul' of the engine, they go misty eyed and start telling stories about unexplainable events. Well, home-made lures are a bit like that. Now, it's not my intention to undermine the lure manufacturing industry, or to destroy the livli-hood of those who sell their wares. Many commercial lures are made to extremely high standards. When every lure is individually tested and balanced, when real experts have designed the shape, action and balance, you have a fish catching instrument worth every penny. When you buy these marvels from expert lure-anglers, prepared to spend time giving advice and encouragement, like Sue from Harris Angling, or Andy Lush from the Friendly Fisherman, or maybe your own local tackle dealer. You are getting a service and product second to none, for a very reasonable cost. However, there is something about a lure made by yourself that cannot be equalled. When you have spent time thinking about the design, shaping it, colouring it, working out how it fishes, catching fish with it, sometimes a relationship starts to develop. The lure starts to take on its own personality. I have one lure, I believe, which actually loves catching pike! I have cast and retrieved the lure, maybe hundreds of times. I can tell when a pike is following it, even in really murky water - honestly. I can feel the thrill coming up the line. Cast after cast, the lure retrieves straight as a die, giving its characteristic wiggle. Yet in crystal clear water, I've seen it suddenly veer toward a patch of weed, or some other feature, give a cunning wiggle, and be nailed instantly by a hidden pike I never suspected was there. No commercial lure ever does that! I have another lure that's absolutely terrified of pike - but that's another story! So, how to 'roll' your own lures. I guess a lot depends upon how ambitious you are and how good you are at DIY. The possibilities are endless, but even the simplest home-made lure will catch fish - in-the right hands. 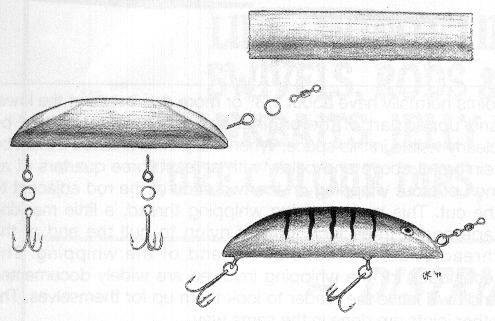 The sketches with this article (done by my non-fishing, cycling-mad son David Roskilly - aged 14) show a simple pattern, easy to make but very effective. Take a piece of broom handle, 6 - 8 inches long. Use a wood-rasp to file down the ends to the shape shown. Sandpaper until smooth. Use a pointed instrument to pilot holes for the screwed-eyes (obtainable from good hardware shops). Be careful when screwing these in, as it is easy to shear them in half (To avoid fixing hooks with a weakened screw). I use a different screwed-eye to pilot the thread into the wood. For additional safety, I stuff the screw-hole with Araldite before final fixing). Paint the lure with acrylic paint (don't worry if not too neat, pike don't mind), and use split rings to fix the hooks and swivel. If a lure doesn't work right first time, you can reshape it (I carry a penknife for bank-side modifications), add weight (strips of lead used to give windows that old-fashioned look are good - obtainable from most glaziers), or repaint it. If you want to change lure colour during a session, coloured tape can be effective, and acrylic paint takes moments to dry (after all I used to repaint my floats as the light changed, why not my home-made lures?). If you want a lure to go deeper, try adding weight to its nose. Add weight to the tail to get it to stay up on the water. Don't be afraid to experiment, even if you mostly use commercial lures you'll learn a lot. But be prepared for heartbreak. We have all experienced that deep sense of loss when a favourite lure, costing many pounds has stopped dead in the water, and no amount of cunning, or persuasion, or prayer will release it from the grip of the lure monster, hidden in the depths. That's nothing to the feeling you get when an old friend, crafted by your own hands, part of a fish catching team, finally hooks up on something hidden in the depths. When you hear the line crack, and the rod lies dead in you hand, believe me, you'd willingly sacrifice the most expensive lure you have to get it back - welcome to the ranks of the 'home-rolled' lure fanatics.